Each year brings ups and downs, joy and pain. 2013 was no different. I did not do a lot of writing to this blog in 2013. It was a year full of changes. I went back to school to pursue my degree, I received a promotion on my job, and every few weeks I found myself on an airplane. I started off 2013 with an empty nest and ended the year with a FULL house. 2014 will be a year in which I celebrate a semi-milestone birthday. It will also be a year that will test the very core of who I am. Last night, my granddaughter asked what New Year resolution I had made. I don’t usually make New Year resolutions. However, I do resolve that in 2014 I will leverage my strengths and laugh so much more than I have ever laughed before. One of the things I like to do is cook. My husband and I are always on the prowl for great recipes. I found a fantastic waffle recipe on Food52.com and I tweaked it for my family. Since I had some fruit, I put it with a little of this and a little of that to make a fruit topping for the waffles. 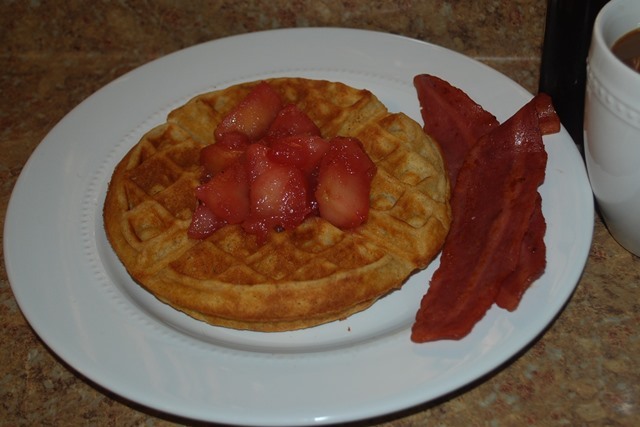 Here is my version of waffles with wine poached fruit. Enjoy! And Happy New Year! P.S. First laugh of 2014. My daughter did what college students usually do and slept VERY late today. She missed out on the waffles. LOL. Whisk milk mixture into flour mixture until clumps of flour are gone. Let batter sit for 30 minutes before making waffles. Follow the directions for your waffle iron to cook the waffles. If possible, serve immediately. To keep warm, put in single layer on a perforated cooking sheet in a 170 degree oven. Peel, core and cut fruit into 1” chunks. Mix fruit and all the rest of the ingredient in a saucepan. Cook over medium-low heat until fruit is soft. Remove fruit from saucepan. Continue to cook liquid until reduced to a syrup. Turn off heat. Add fruit back to saucepan. Stir fruit to coat with syrup. Serve over waffles. Categories: Cooking | Tags: cooking | Permalink. I started sewing when I was 11 years old, and had my own clients when I was 12. I graduated from the H.S. of Fashion Industries, majoring in fashion design. I expanded my technical background by attending evening classes at the Fashion Institute of Technology and working many years at a major pattern company. I have been creating custom wedding gowns and evening dresses for more years than I care to count. I LOVE WORKING WITH FABRICS. I love fine sewing techniques. I love creating beautiful dresses. Thank you for the excellent tutorial on making shoulder pads. I am tailoring again after a 40-year hiatus. (That makes me sounds very, very old. I am 63, however old that is.) I see that you haven’t posted since January 2014 and can surmise that you still have a full household and a demanding job. I left a job in D.C. 25 years ago, married, soon had two children and have gotten them off to college. Whatever your time situation, I want to encourage you that you have a great way of writing, teaching and I like the style of your sewing projects. Do you know how few sewing blogs focus on high style, high quality sewing? P.S. My blog hasn’t been touched in a year, either. I haven’t learned how to change my business/ academic writing style to a newsy, folksy style that works on blogs. I thought it sounded like a balance sheet report. Maybe I’ll try again some day. If you want to reply, try my email instead of blog: thesewinggrove@gmail.com Best wishes to you!